Android TV (initially installed with Android 5.1 "Lollipop", with updates to Android 6.0 "Marshmallow") and Android 7.0 "Nougat"
Running the Android TV operating system (first-generation was originally released on Android 5.1 "Lollipop" and have since then recieved official updates to Android 6.0 "Marshmallow" and Android 7.0 "Nougat") on a Tegra X1 SoC (System on Chip), the NVIDIA SHIELD TV stands above most of the other high-end Android-based offerings not only because best-in-class hardware offering the fastest graphics for gaming capabilities for Android, but also because due to NVIDIA's strong product support and long lifecycle updates of their own SHIELD series products. It comes with remote friendly versions of Amazon Video, Netflix, Vudu, Hulu, HBO, UltraFlix, Fox, Google Play Movies, and other video service clients, with many supporting videos in native 4K Ultra HD (2160p) resolution at up to 60 frames-per-second and HDR. The Android TV platform delivers good conversational voice search for the native Android TV (leanback) app via an integrated microphone inside the included game controller. Adding to that it also comes with NVIDIA's gaming ecosystem capable of running all graphically intensive AAA ("triple A") games for Android in 1080p at 60fps, as well as supporting NVIDIA's low-latency GameStream technologies for GeForce-equipped PC game streaming in up to 4K HDR resolution, including direct access to Steam Big Picture from the Steam app, and NVIDIA's "GeForce NOW" (formerly "Nvidia GRID") cloud game-streaming service. All these gaming features combined with high-end media player functionality makes it a very good convergence device when pairing with Kodi for media playback. Normal "vanilla" builds of Kodi should run just fine on the Shield. Skins like Amber allow you place custom shortcuts on the main menu for an Android apps as favorites. You can use standard Bluetooth accessories, such as a wireless keyboard, mouse, or game controller with your Nvidia SHIELD TV console. Other standard Bluetooth remotes (such as the Amazon Fire TV replacement remote) can be paired and should also work. Logitech Harmony IR Remotes are supported by NVIDIA SHIELD (2015) and NVIDIA SHIELD Pro (2017). The NVIDIA SHIELD (2017) with 16GB storage does not have an IR receiver. Generic Android-level CEC support is available on the Android TV platform, however Kodi will not see a CEC device directly, but instead just treat the it like generic input. USB port allows for various additional remote types, such as FLIRC IR dongle, various RF dongles, etc. Most of these devices will likely show up as a keyboard type input. It should be possible to pair other bluetooth controllers and remotes to the NVIDIA SHIELD TV Console. Most of these devices will likely show up as a keyboard type input. Reported working with a Microsoft Bluetooth Mobile Keyboard 6000. 8Bitdo NES30 controller is working, but is not recognized by all Android games. 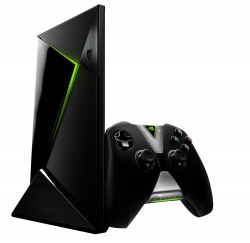 Some of this is copied directly from NVIDIA's GeForce Forum for SHIELD Android TV support. More generic but useful info about the SHIELD Android TV that is not specific to Kodi can also be found in NVIDIA's official SHIELD FAQ and SHIELD User Guide. If you hold the play button on the SHIELD game controller a mouse cursor will pop up on your screen and turn the right analog thumb stick on your game controller to a mouse controller which can control that mouse cursor. If you plan on using a microSD card or USB storage with your SHIELD, make sure to unmount the drive before unplugging it. This is done from Settings -> Storage and reset inside the Android TV menus, not inside Kodi. Select your storage device and then choose the unmount option. Now you may safely unplug/remove your storage device from your SHIELD Android TV. If you are unable to pair your SHIELD game controller during initial setup and your SHIELD is connected to your network over wired Ethernet, try temporarily disconnecting your wired Ethernet cable to go into WiFi mode and check if pairing issue is fixed. If the Google Play Store is not opening, check if the version is at least 5.5.15 or later. If not you should be receiving this update soon. After the update if the problem continues, try clearing the data and cache for the Google Play Store app. For maximum performance, wired Ethernet is recommended. The wired Ethernet port on SHIELD supports 10/100/1000 Mbps. Once wired Ethernet is connected, SHIELD will disable Wi-Fi and automatically switch to use only wired Ethernet. If you experience audio playback issues try going to Settings -> System -> Audio output and setting the value for Keep audio device alive to Never (the default is 1 minute). If you press and hold the "O" button on the SHIELD remote (or the Nvidia button on the game controller) it will pull up a window that allows you to take screenshots or a video of anything that is being displayed on your TV. If you use the video function it will capture both video and audio of anything currently being displayed. Also, if you have ES File Explore installed, you can directly upload the screenshot or video to any location that ES has access to. Watching 4K content from SHIELD requires a 4K UltraHD display with HDMI 2.0 and HDCP 2.2 support. Connect SHIELD to only the 4K-enabled HDMI input that supports HDCP 2.2. Consult your 4K UltraHD display's user guide to find the correct HDMI port to plug SHIELD into for watching 4K content. SHIELD also supports content rendered with 4:4:4, and 4:2:0 chroma subsampling frequency ratios. (NOTE: Netflix 4K content is currently only enabled for HDCP 2.2 ports. See your 4K UltraHD display's user guide for further details). If one of the HDMI 2.0 ports does not work then try another until you find a port that works. Use of an AV Receiver with HDMI for video and Toslink for audio may result in audio lagging behind video, and each of the these type of configurations may add varying levels of delay along the audio and video path resulting in lip-sync issues in the content viewed on the TV. Use the built-in AV sync slider utility (not in Kodi) in the SHIELD menu Settings > HDMI > AV Sync Tuner to calibrate for any audio lag. Adjust the delay on the audio signal until you hear the audio beep from your speakers exactly when the bouncing ball touches the line. The AV sync slider allows you to advance audio by 1 second at most (in small increments of 10ms) to synchronize the audio and video. (Note: This tool is effective only when SHIELD is connected to your AV Receiver over HDMI (i.e. audio/video over HDMI); it is not meant to be used when a headset is plugged into SHIELD controller/SHIELD remote or USB audio device or Bluetooth audio device). If video lags behind audio instead (i.e. audio is ahead of video) then use your AV receiver’s settings to delay audio. Known issues and limitations related to usage of Kodi on NVIDIA SHIELD TV, including limitations in the hardware, firmware, and software directly or indirectly related to and for Kodi usage. HDMI-CEC is supposedly supported supported in the hardware and in the Android firmware, but no news yet on API or other interface with LibCEC for native (direct) Kodi support of the CEC controller. Kodi's existing video playback options for "Adjust display refresh rate to match video" and "Sync playback to display" to sync screen refresh rate to playback frame rate option is included in the Kodi 15.x (Isengard) releases, but it is still limited to 24/25/30/50/60 Hz refresh rates in the firmware from Nvidia. Nvidia's Shield Android TV OTA 2.0 Update also added support for for 23.976 and 59.94 Hz but it may not work in Kodi for all setups. Automatic refresh rate switching is not working with all televisions brands/models, and on some that do work only do so after the SHIELD have been rebooted/restarted or booted after your television and AV-receiver. Other than waiting for future firmware updates the general advice is to try another HDMI until on your television or AV-receiver you find a port that works (or work better). MPEG-2 hardware decoding (and hardware deinterlacing) did not work before NVIDIA SHIELD TV Pro OTA Firmware version 1.2 update, so be sure to update to latest firmware. VC-1 and WMV-9 videos are software decoded only so far, reason for this is that NVIDIA have so far only licensed MPEG-2, H.264, HEVC (H.265), and VP9 codecs for video playback, as well as Dolby Digital (DD) and Dolby Digital Plus (DD+) for audio, (and unfortunately NVIDIA do at least not yet offer a add-on license keys for a codec pack similar to Raspberry Pi). There is however apparently a hack available to enable VC-1 hardware decoding by editing Android file "/system/etc/media_codecs.xml" if you have first rooted the SATV. HD audio including DTS-HD MA, DTS:X, Dolby True HD, Dolby Atmos can be all be passed-through (bitstreamed) on Nvidia Shieild TV, but this currently only works with the native video player. Pass-through for HD audio is currently not working in Kodi and is a work-in-progress. The Nexus Player remote does not pair at all with the Shield console. It did with the Razer Forge, but not the Shield console. VP9 hardware video decode is supposedly supported at to to 4K / 2160p (UltraHD) resolution, such as YouTube source, but not yet confirmed working in Kodi for Android on the NVIDIA Tegra X1 (TX1) SoC. VC-1 hardware decoding (possibly including hardware deinterlacing?) is suppose to work since OTA Firmware version 2.0 update from NVIDIA for SHIELD TV, so be sure to update to latest firmware and run tests in Kodi for independent confirmations. WMV-9 hardware decoding (possibly including hardware deinterlacing?) is suppose to work since OTA Firmware version 2.0 update from NVIDIA for SHIELD TV, so be sure to update to latest firmware and run tests in Kodi for independent confirmations. OTA Firmware version 2.0 update from NVIDIA for SHIELD TV is suppose to have added native playback and output of video content encoded at 23.976 and 59.94 Hz. Also supports since erlier are video content encoded at 24 Hz, 25 Hz, 30 Hz. This however needs testing and confirmation if it works with Kodi's existing video playback options for "Adjust display refresh rate to match video" and "Sync playback to display" to sync screen refresh rate to playback frame rate option is included in the very latest nighty builds. Note though that automatic refresh rate switching will not work with all televisions brands/models or in all HDMI ports. OTA Firmware version 3.2 update from NVIDIA for SHIELD TV is suppose to have native pass-through/bit-streaming audio support for AC3, EAC3, Dolby 5.1, Dolby 7.1, DTS-HD, DTS-HD MA, DTS:X, Dolby TrueHD, and Dolby Atmos, up to high resolution 24-bit 192 kHz audio over HDMI and USB. Also added is support for USB-S/PDIF dongles which can enable users to connect SHIELD to older sound bars and audio receivers. All this however needs testing and confirmation if it works with Kodi's very latest nighty builds of Kodi for Android. This page was last edited on 19 October 2018, at 08:10.